This is the salad I made from the cookbook Franny's Simple Seasonal Italian that accompanied the Spaghetti with Chickpeas I wrote about yesterday. The original recipe calls for walnuts, but I substituted pecans since that's what I had on hand. Celery leaves are the herb ends of celery stalks. If you buy celery hearts they are generally cut off ahead of time, so buy the longer celery to get them still attached. 1. Preheat oven to 350 F. Spread pecans on a baking sheet lined with parchment. Toast until fragrant and lightly browned, about 8 minutes. Allow to cool and then roughly chop. 2. 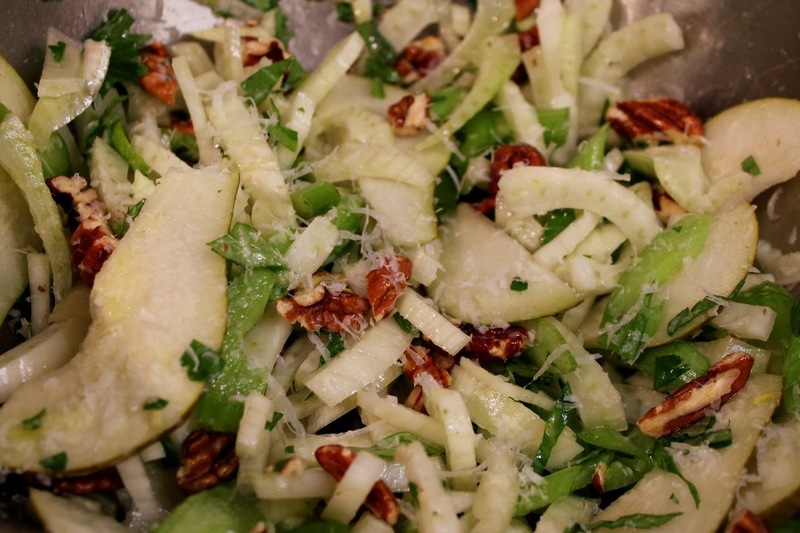 Combine the fennel, celery, celery leaves, pear and toasted pecans in a large bowl. Whisk together the lemon juice, olive oil, salt and pepper, pour over salad and toss to combine. Serve topped with shaved pecorino cheese. You can never go wrong with pecans. Good salad!